After appointing former Toon boss Glenn Roeder as the new Canaries manager earlier in the week, the club official announcement today that Newcastle reserves will be loosing Lee Clark to the Norfolk club as Roeder's assistant on a two-and-a-half-year contract. 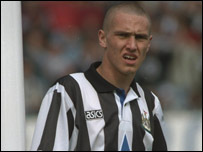 Lee began his playing career with Newcastle United, making his debut in the 1990/91 season. He left St. James' Park in the summer of 1997. After playing for Sunderland and Fulham he returned to Gallowgate at the start of the 2005/06 season under Graeme Souness. In total, Lee made 265 appearances for United and scored 28 goals.